You are here: Virgin Islands News Online » News » Hon Walwyn's politics is 'wicked' & 'divisive'-Claude O. Skelton-Cline. 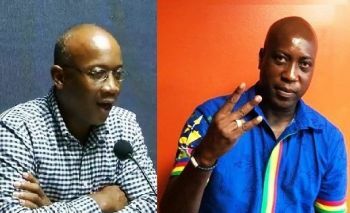 Mr Skelton-Cline lambasted the NDP Leader at the close of his Tuesday, December 4, 2018, radio broadcast, as he responded to Hon Walwyn’s earlier public statement to residents of the Territory, in relation to the state of affairs of the party. Honestly Speaking’s Skelton-Cline in clapping back at the NDP Leader said he needs to be called out for his sentiments and for him to be held accountable. The radio host said, Hon Walwyn’s tactics are in fact, “wicked and they are deceiving." He was at the time making reference to Walywn’s retort of disappointment, in those that defected from the party and resigned while at the same time accusing them of turning their backs on their elected representatives. Claude..... the wickedness and divisive politics I see, surrounds the party your uncle formed. You and them are all BITTER. End of story. Im terms of style there's no difference between Myron and Trump. They thrive on confusion, division, & political bullying. "The radio host and social commentator, told listeners “I want to caution this community and even caution the Chairman (Hon Walwyn) that we do not engage in political whistle blowing, where we are giving one type of message to one group of the community, while signalling a different one to the rest of the community.” Sir are you a commentator or a judge? I am so glad that someone took that man to task. Speaking with one tongue that the upcoming elections should not be of a derogatory nature, while using the other twisted tongue to bash the members of the new party in a 'subtle' manner (as if we are mumus and don’t realise what he is doing). Give us credit, Man. We are neither fools, idiots nor mumus. You can only recognize evil and wicked in others when you yourself possess the same character. Let’s not forget how you played dirty when you ran for politics when you came back home. is this the man of the cloth calling people I thought the is a scripture that says judge he not that he may not be judged but claude you know you live in a glass house please don't throw stones. anyone ever wonder why he run back from detroit. Why he "run" from Detroit is none of your business. Some of you Tola people to messy. Where did you run from, struppes. Tunnel vision! Is this the good pastor or the social commentator? The words in the pulpit and the radio pit does not seem to be saying the same thing? So who speaking with fork tongue? Oh no there's a snake somewhere on the air plain! No no there's a snake on the air plain? Is it a cloude it it a fraude? Seems like His show is the hateful arm of VIP. With a hatred objective to bring Myron down. His sponsors need to take a second look as to the damage the show is doing . Is Myron the premier of the BVI, so why is he carrying the blame of 13 adults? we need to stop they are all at fault. He is not only carrying the blame for the 13 adults. He is carrying the blame for everything that went wrong the BVI.